We have a wonderful book that Tomas picked out for Maggie’s birthday this year. When she unwrapped her gift she smiled, and said “Dad really does know what I like” — he really does. 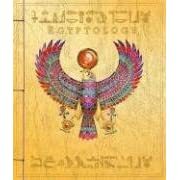 The book is called Egyptology , has a beautiful gem embedded in it’s cover, and is overflowing with wonderful tidbits about Egypt. It is written like an explorer’s journal and has tons of little things to discover: a letter from the author, post cards from Egypt, real papyrus, real mummy cloth, a guide to understanding Hieroglyphics… it is beautifully illustrated and has given both M&B hours of enjoyment. While at school both kids picked out books on Egypt (this is a Proud Mommy Moment) without my prompting. M chose a lovely fable called Zekmet The Stone Carver – A Tale Of Ancient Egypt. It is written by Mary Stolz, and illustrated by Deborah Nourse Lattimore. B picked out a book called Children of Other Lands — Egypt which tells you all about what it is like to be a child in Egypt. From the games they play, to the foods they enjoy. [Note: I couldn’t find this one on Amazon, but it is worth checking if you can get this at your local library].